On 1st October 2014 Microsoft have released the Windows 10 Technical Preview OS and thus the Operating System Windows 10 Technical Preview is available to download in 32-bit and 64-bit versions with languages US English, UK English, Chinese and Brazilian Portuguese. 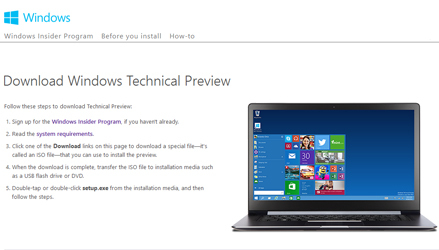 If you want to get familiar with the Windows 10 Technical Preview Download and Installation process follow the below instructions on How to Download and Install Windows 10 Technical Preview. As we already know this is Technical Preview of Windows 10 and this OS is solely made to those who wants to test or have a look before the official release of Windows 10 Final Build OS, so it could be risky if you are installing Windows 10 Technical Preview on your primary or business computer as in rare cases unexpected crashes could even damage or delete your data from your computer. So before you start Installing Windows Technical Preview it is recommended to take backup of your data to be on safe side. Secondly if you want to revert back to previous version after upgrading to Windows 10 Technical Preview to Windows 8 or Windows 7 it will not be possible as you will have to reinstall it by putting the respective OS DVD. 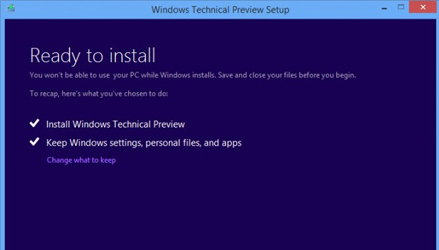 To Install Windows 10 Technical Preview your PC it must meet following requirements. Before you download the Windows 10 Technical Preview ISO, you will have to join the Windows Insider Program by following this link. It will take few seconds and clicks to join Windows Insider Program if you are already owning a Microsoft Account. Then to download Windows 10 Technical Preview OS ISO File you will have to navigate to Microsoft Official website by following this link, download appropriate Windows 10 Technical Preview ISO File in 32-bit or 64-bit and according to your language. Windows 10 Technical Preview 32-bit ISO File will be around 3GB and Windows 10 Technical Preview 64-bit ISO File will be around 4GB, so download according to which you’re PC Supports. Also note down the Windows 10 Technical Preview product key so that it will be easy to you when you are prompted to enter the product key while installing the OS. 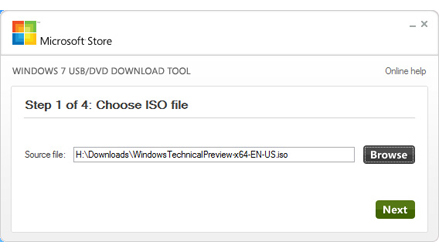 After you have finished downloading the Windows 10 Technical Preview ISO File you will have to burn the file in to a DVD or else if you don’t have DVD Drive or want to install Windows 10 Technical Preview through USB Drive than you will have to Burn the ISO Image to a USB Drive by using Windows 7 USB/DVD Download Tool. So after you are ready with the Windows 10 Technical Preview on DVD or USB Drive, to install fresh copy of Windows 10 Technical Preview you will have to insert the DVD or plugin the USB Drive to your computer and reboot it and follow the installation prompt process. And if you want to upgrade your existing version of Windows 7, Windows 8 or Windows 8.1 to Windows 10 Technical Preview you will have to run the setup.exe from USB or DVD Drive. Hope this article have resolved and solved your problem regarding Installation of Windows 10 Technical Preview.